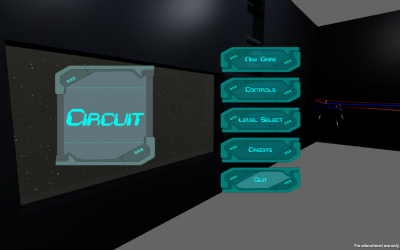 Circuit is a first-person, physics-based puzzle-solving game that focuses on 3-D spatial-awareness and manipulating the world around you. The game takes place in a space station, where the player realizes they are alone and has the goal of making their way to the Command Center. Along the way there are obstacles in the form of puzzles that the player will need to solve in order to move forward. 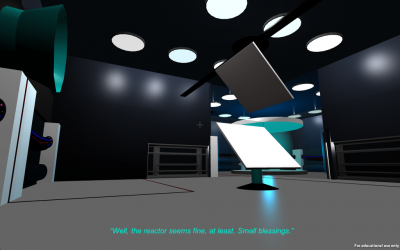 The goal of the game is to solve the puzzles in each level by getting the energy ball from one side of a room to the receiver, in order to get to unlock the way to the Command Center. To move, use the Arrow keys, or the WASD keys. To jump, press the spacebar. To fire the energy ball from the launcher, press the ‘E’ key. To prematurely stop the energy ball, press the ‘E’ key again. To rotate the sloped panels, hover over the object with the mouse until it turns green and then click the Left and Right Mouse buttons. To move the sliders (with the panels on top), hover over the object until it turns green and click the Left Mouse Button.